This originally appeared on my Tumblr. I received Julie Berry's ALL THE TRUTH THAT'S IN ME as an ARC at ALA, and it blew me away. Julie's heroine is so strong and constant. The prose is lyrical but always essential, and the story's redemptive and inspiring, not to mention a great mystery. AHHH!!! Libba Bray's BEAUTY QUEENS is high concept, feminist, satirical, diversely inclusive, action-packed, playfully referential, brashly hopeful while not being afraid to get dirty . . . Libba Bray has my heart, with this line and with this whole book: “Maybe girls need an island to find themselves. Maybe they need a place where no one's watching them so they can be who they really are." Trent Reedy's WORDS IN THE DUST came out in 2011, and Trent's a friend so I should have read it right away, but I'm terrible about putting off books about "heavy" subjects or books that I fear will make me cry. I shouldn't have worried because while the book does deal in heavy subjects and while it did make me cry, it also had some relieving lightness and humor as well as a main character I looked forward to spending time with. I read it quickly and then missed it. Jacyln Moriarty's THE MURDER OF BINDIE MACKENZIE. I might have been a Bindie MacKenzie as a kid, a little too booksmart and imaginative for my own good but not so socially smart. I love the quirkiness of Moriarty's characters, the fanciful bending of expectations, and the structure of a school project that's compelling as a personality quiz. Justine Larbelestier's LIAR. I can't talk too much about it without being spoilery, but this book defies genre classification and plays along the edges of other boundaries as well. It's a mystery as much as it is anything else, and I devoured it. Jay Asher's THIRTEEN REASONS WHY. I listened to the audiobook during one long drive, and it not only kept me awake, it made me camp out in numerous parking lots to hear more when I really needed to get out of the car. The structure's perfect, the unraveling of the backstory is masterful, and the subject's of life-and-death importance. More Libba Bray. THE DIVINERS. This woman, I swear. Flappers, a museum of the occult, a horror-show crime drama, an epic cast of characters, and the slow but inevitable awakening of superheroes . . . It's like she set out to put all my favorite things in one book. Libba Bray is winning the contest of writing great books about things Rachel loves. I got to hear Amy Rose Capetta read from ENTANGLED in her last residency at Vermont College of Fine Arts, and I got to hear a lot about it while we were two of three members of a short-lived writing group in Chicago (short-lived b/c AR had to move). But I didn't get to read ENTANGLED until it came out, and it made me so happy. I'm a fan of a crew of misfits on a mission, and Amy Rose's characters are so unique and engaging. Her prose is gorgeous as well and the story compelling, but I knew that when I first heard her read. In THE WOKEN GODS, Gwenda Bond gives credit for inspiration to Lewis Hyde's TRICKSTER MAKES THIS WORLD, a book I cited in my critical thesis for school. I love tricksters almost as much as I love strong yet real heroines on exciting quests with the fate of the world in the balance. Both are in full force in this book, and it regularly kept me up way past my bedtime while i was reading. When I heard about the sale of Cori McCarthy's THE COLOR OF RAIN, I was surprised (and weirdly charmed? is that the right word) by the concept of a YA about a prostitute in space. The book was much darker and more lyrical than I expected. It didn't shy away from physical violence or from the messiness of its tough narrator's emotions and attachments. I applaud it for badassery on many levels, and for being a driving read that made me unable to surface for breath till it was over. And one to grow on? 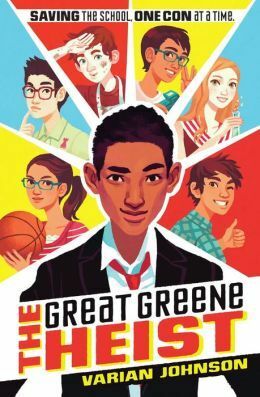 I had an early chance to read my bud Varian Johnson's 2014 THE GREAT GREENE HEIST. It was still in revision, so I'll have to come back to it next summer, but it was already so full of well-crafted capers and humor. I can't wait for the rest of the world to get to read this one.